(Nanowerk News) Scientists with USDA's Agricultural Research Service (ARS) bred yellow potatoes with carotenoid levels that are two to three times higher than those of the popular Yukon Gold yellow-fleshed potato variety. ARS plant geneticist Kathy Haynes and nutritionist Beverly Clevidence did the research at the agency's Henry A. Wallace Beltsville Agricultural Research Center in Beltsville, Md. Haynes works in the Genetic Improvement for Fruits and Vegetables Laboratory (GIFVL) at the Beltsville center, and Clevidence works in the center's Food Components and Health Laboratory. They published their findings in the Journal of the American Society for Horticultural Science. Peter Wilcox potatoes. This yellow-fleshed, purple-skinned potato has overall carotenoid levels about 15 percent higher than Yukon Gold potatoes. Haynes found wild potatoes with intense yellow flesh that have about 23 times more carotenoids than white-flesh potatoes. By crossing these wild potatoes with cultivated types, Haynes and her colleagues developed the high-carotenoid potatoes. In 2007, Haynes and her colleagues introduced a new potato named Peter Wilcox that they developed. 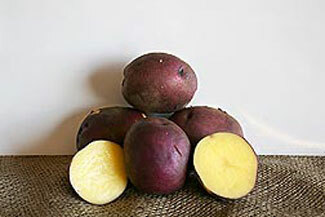 The potato, which has purple skin and yellow flesh, has become popular in niche roadside markets. The overall carotenoid levels in this potato are more than 15 percent higher than those in Yukon Gold, according to Haynes. Several carotenoids are involved, including neoxanthin, antheraxanthin, violaxanthin, lutein and zeaxanthin. Among these, lutein and zeaxanthin, are of keen interest for eye health; they appear to protect against age-related macular degeneration and perhaps against cataract formation. Read more about this and other fruit and vegetable research in the October 2012 issue of Agricultural Research magazine.